If you're a band coming from the UK's Midlands or Birmingham proper, you better have the chops, better, the balls and skills to deliver the heavy metal goods. Devil's Dice shares home ties with the likes of Black Sabbath, Judas Priest, Napalm Death, and Wizzard to name a only a few. Large shoes to fill, long legacy to appreciate and extend. 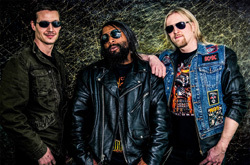 But Devil's Dice, currently a three piece of founding members and guitarists David Clark and Chris Webb with Matt Gore on vocals, may have some potential to live up to their heroes with their first album, Libertarian. 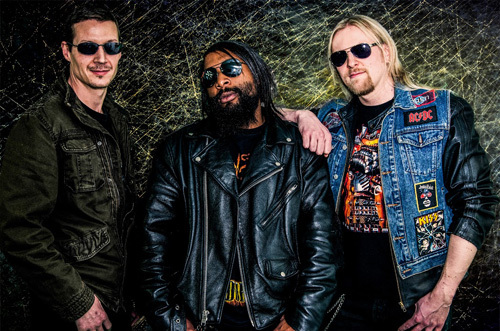 Their sound sways between traditional melodic hard rock and heavy metal, UK style of course. Being founded by two guitarists you can also expect their sound to be very guitar oriented. Actually, if you notice anything, right from the start, it's the guitars. They can only be described as sounding brisk and sharp, even nearing the shrillness of fingernails scraping a blackboard. It also means that you get a blast of searing sharp guitar solos in every song. So if you like twin guitar harmony and large solos, Devil's Dice brings something positive to the table. Alternatively, referring to the tone, and not so much their place in the arrangements (being mammoth), the guitars also sound pretty much the same across the entire album which gives the album more than a little redundancy. Ergo, after a few songs, three to four, I basically knew how this entire album would sound. And this had the unfortunate result of me breezing the album rather quickly on the second spin. The other thing that struck me about the guitar lines comes in their relationship with vocalist Matt Gore. The sharp tone of the guitars didn't seem to fit his vocal style. Gore has smooth melodic delivery, but it's almost too straight forward, even, nearly unemotional. He doesn't have a problem rising above the music, but his tone is a marked contrast to the pervasive guitars. Perhaps this was intended. As for the songs themselves, as mentioned earlier, thanks to the guitar lines, they all seemed to simply run together. Yet, despite this, a few caught my ears, if only because the melody was more present and the refrain more catchy. These would be Feed The Flames, I Walk Alone, and Chameleon. Nevertheless, with these things said, and not that there isn't some potential in Devil's Dice, I'll likely not spin this album again. Listen below and make up your own mind. Founded by two guitarists and bristling with sharp guitar lines and leads, upon listening to Devil's Dice and Libertarian, the pervasive guitars are likely all that you'll hear.